This might be the sort of recipe that you see flying through Facebook and Pinterest and think to yourself: Looks cool, but too much work. Hang with me though! 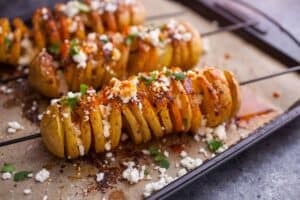 These Chili Tornado Potatoes really are about as easy as a delicious baked potato, except they have crispy bits and “tornado-ing” the potato allows all the delicious spices to penetrate better. The preparation is obviously a bit more than tossing some whole potatoes in the oven, but it pays massive dividends. The first one will take you a few minutes to spiral cut, but you’ll get really fast at it by the end. And, more importantly, it doesn’t have to be perfect. Some of your spirals may be a bit wider or narrower. Or, SHOCK/HORROR, you may actually cut through the potato, ruining the spiral look. No worries. It’ll all taste delicious when you brush it with butter and bake it with a liberal sprinkle of chili spice. So, please, Pin this recipe and share it on Facebook or whatever, but also – like – make it. 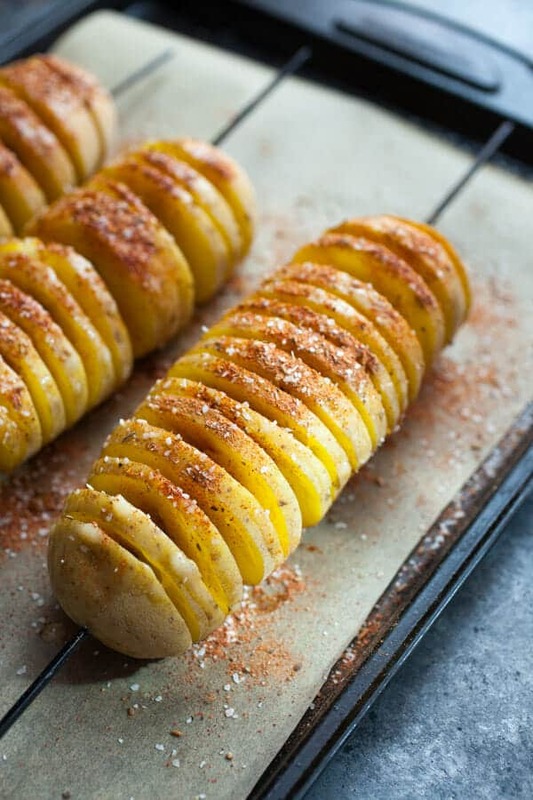 Perfectly seasoned potatoes cut in a swirl and baked. Topped with a crumble of cheese and cilantro. A great tex-mex or side or party appetizer! Preheat oven to 350 degrees F. Scrub potatoes well, then dry and skewer onto metal skewers. Try to get the skewer in the center of the potato, longwise. Use a small paring knife to cut the potato into a spiral. As you work down the skewer, cut down to the skewer at an angle. 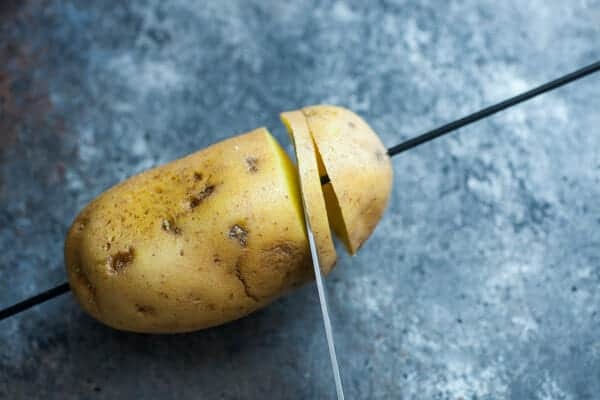 If you accidentally cut through the potato, it’s okay! It’ll still taste good. 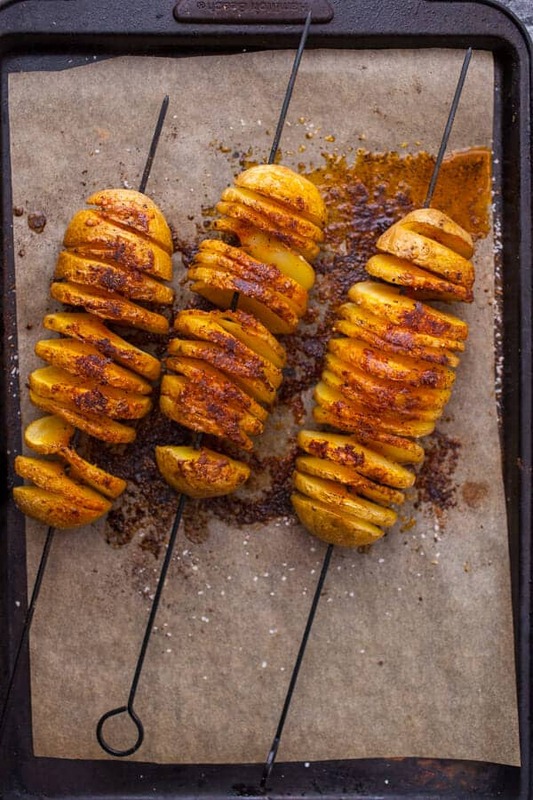 When you have all your potatoes spiraled, place them on a baking sheet lined with foil or parchment paper. Brush the potatoes liberally with melted butter. 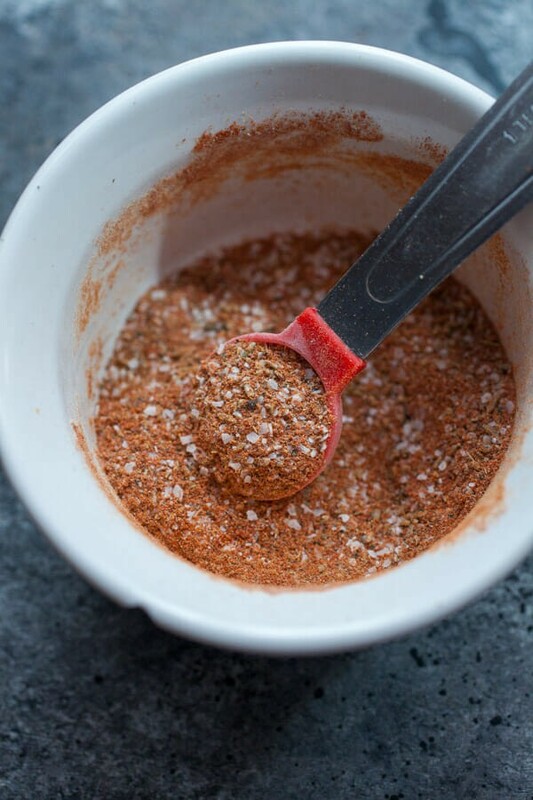 Then sprinkle with seasoning mix. Bake potatoes for 40-45 minutes, turning once halfway through so they cook evenly. Finished tornado potatoes should be cooked through and tender, but crispy in spots around the edges. 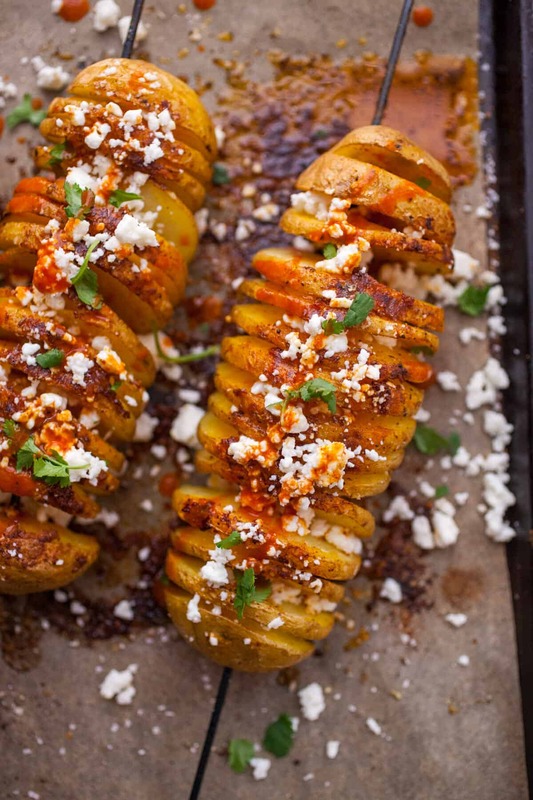 Remove potatoes and sprinkle with queso fresco, fresh cilantro, and a little extra seasoning mix. Serve while warm. You cannot make these suckers without some skewers. You could use bamboo skewers provided you soak them really well, but this is one time that I prefer the metal skewers actually. Scrub your potatoes well and then dry them off. 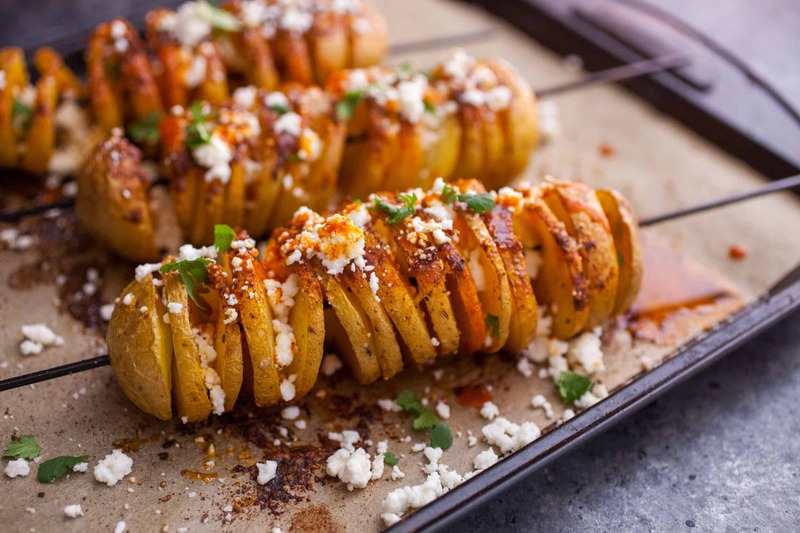 Skewer each potato right in the center and then use a paring knife to start spiral-cutting the potatoes. 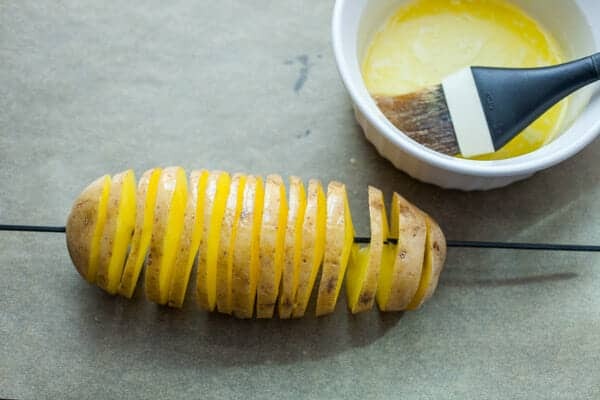 As you cut around the potato, you’ll hit the skewer which ensures that you don’t cut too deep and by cutting at a slight angle, you’ll achieve that spiral look! The finished potato is a thing of beauty! Brush each one with some butter and make sure to get it in all the spirals. I mixed up a quick tex-mex inspired spice mix for my tornado potatoes. To be honest though, you could put almost any spice on these guys or just keep them simple with salt and pepper. Feel free to have a liberal hand with the seasonings on these. Flip the potatoes to make sure you season all sides also! When it comes to cooking, I baked these for about 45 minutes at 350 degrees F. There’s absolutely no reason why you couldn’t toss them on a grill though. Just start them over indirect heat so they don’t cook too quickly and give them plenty of time to get tender and crisp up. These are good right out of the oven, but if you want to take them to the next level, sprinkle each tornado potato with some crumbled queso fresco, fresh cilantro, and maybe a dash of hot sauce. Tornados are my new favorite potato! I can think of one reason I can’t throw them on the grill… about 12 inches of snow on top of the grill! lol!! Happy Spring! Very pumped to try this. But first, sheet pan egg sandwiches!